Sainsbury's also says it will cap the amount of profit it makes on petrol. 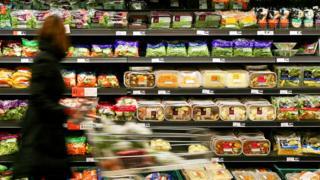 The supermarket giants are battling to convince the Competition and Markets Authority (CMA) to allow them to merge, a move that would see them overtake Tesco to become the UK's biggest chain. The CMA said last month it could block the merger between Sainsbury's, the UK's second-biggest supermarket chain and Asda the third biggest, currently owned by US giant Walmart. On Tuesday, Sainsbury's and Asda's joint statement said the CMA's provisional findings contained "significant errors". In a robust statement, it criticised the CMA's threshold at which concerns were triggered. It said this was set at an "unprecedentedly low level", which, therefore, generated an unreasonably high number of areas of concern. Sainsbury's will cap its fuel gross profit margin to no more than 3.5p per litre for five years; Asda will guarantee its existing fuel pricing strategy. The CMA's final decision is due on 30 April. For Sainsbury's and Asda bigger is better. They say joining forces would make them better placed to fend off the likes of Aldi and Lidl. Today's update provides some more detail on that price commitment. It's part of their attempt to persuade the CMA to change its mind. But given the scale of the regulator's concerns and how hard they will be to overcome, Sainsbury's faces an uphill task to secure the green light, even if it is promising £1bn a year to drop prices.